Suffering from a wandering mind is the bane of many people’s lives, whether studying or working. The science behind it relates to the energy needs of our brain’s neurons. Research shows that they can survive focused on their task for about 12 seconds but then need to refuel with glial cells or glycogen. If they don’t get this they can get easily drawn to other, more demanding parts of the brain. It has been shown that the lack of ability to maintain focus can put us in a negative mood and make us unhappier. 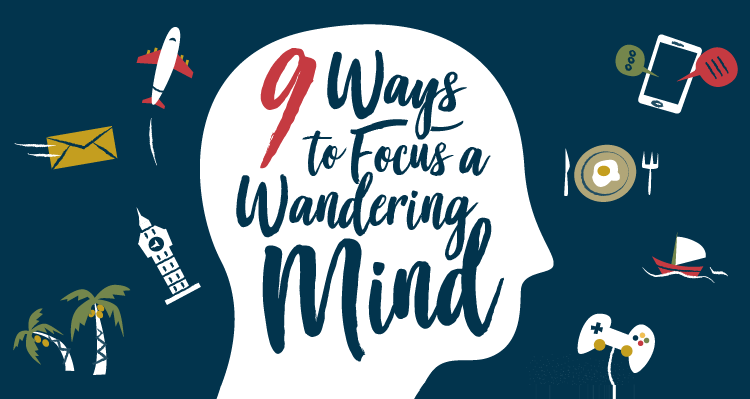 To keep on track, On Stride Financial has put together this infographic with tips on how to keep your mind from wandering. Here we’ll look at a few of them. Music without lyrics, such as classical music, can provide a benign distraction for your mind. Once your mind is focusing on two things, even if one is minor, it is less likely to go searching for a third. If your distraction is a recurring one, such as a nascent love interest or an unresolved argument, try imagining this as an image. Visualize putting this picture far away, such as on a distant island or in a locked safe. Caffeine activates your brain and body, making it more aware. Thus, if your mind is wandering, try having a cup of coffee or eating dark chocolate to gain a stronger hand on your cerebral reins. Counting 10 deep breaths is one of the oldest and simplest meditation tricks for refocusing our mind. Just inhale slowly, hold for a couple of seconds and exhale slowly. Repeat this for at least 10 times to clear your mind. Focusing all our mind’s energy on one topic is necessary to complete the things we want in the time we want to do them. To stop your mind from wandering and playing havoc with your plans, try out these tips and see which ones work best for you.